Cratylus (/krəˈtaɪləs/; Ancient Greek: Κρατύλος, Kratylos) is the name of a dialogue by Plato. Most modern scholars agree that it was written mostly during Plato's so-called middle period. In the dialogue, Socrates is asked by two men, Cratylus and Hermogenes, to tell them whether names are "conventional" or "natural", that is, whether language is a system of arbitrary signs or whether words have an intrinsic relation to the things they signify. The subject of Cratylus is the correctness of names (περὶ ὀνομάτων ὀρθότητος), in other words, it is a critique on the subject of naming (Baxter). the best possible way to speak consists in using names all (or most) of which are like the things they name (that is, are appropriate to them), while the worst is to use the opposite kind of names. One countering position, held by Hermogenes, is that names have come about due to custom and convention. They do not express the essence of their subject, so they can be swapped with something unrelated by the individuals or communities who use them. The line between the two perspectives is often blurred. [clarification needed] During more than half of the dialogue, Socrates makes guesses at Hermogenes' request as to where names and words have come from. These include the names of the Olympian gods, personified deities, and many words that describe abstract concepts. 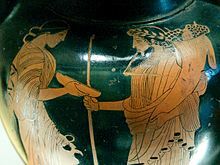 He examines whether, for example, giving names of "streams" to Cronus and Rhea (Ροή – flow or space) are purely accidental. Don't you think he who gave to the ancestors of the other gods the names “Rhea” and “Cronus” had the same thought as Heracleitus? Do you think he gave both of them the names of streams (ῥευμάτων ὀνόματα) merely by chance? The Greek term "ῥεῦμα" may refer to the flow of any medium and is not restricted to the flow of water or liquids. Many of the words which Socrates uses as examples may have come from an idea originally linked to the name, but have changed over time. Those of which he cannot find a link, he often assumes have come from foreign origins or have changed so much as to lose all resemblance to the original word. He states, "names have been so twisted in all manner of ways, that I should not be surprised if the old language when compared with that now in use would appear to us to be a barbarous tongue." The final theory of relations between name and object named is posited by Cratylus, a disciple of Heraclitus, who believes that names arrive from divine origins, making them necessarily correct. Socrates rebukes this theory by reminding Cratylus of the imperfection of certain names in capturing the objects they seek to signify. From this point, Socrates ultimately rejects the study of language, believing it to be philosophically inferior to a study of things themselves. An extensive section of Plato's dialogue Cratylus is devoted to the etymology of the god's name, in which Socrates is arguing for a folk etymology not from "unseen" but from "his knowledge (eidenai) of all noble things". The origin of Hades' name is uncertain, but has generally been seen as meaning "The Unseen One" since antiquity. Modern linguists have proposed the Proto-Greek form *Awides ("unseen"). The earliest attested form is Aḯdēs (Ἀΐδης), which lacks the proposed digamma. West argues instead for an original meaning of "the one who presides over meeting up" from the universality of death. In Ionic, /w/ had probably disappeared before Homer's epics were written down (7th century BC), but its former presence can be detected in many cases because its omission left the meter defective. For example, the words ἄναξ "(tribal) king, lord, (military) leader". found in the Iliad, would have originally been ϝάναξ /wánaks/ (and is attested in this form in Mycenaean Greek), and οἶνος "wine" are sometimes used in the meter where a word starting with a consonant would be expected. Further evidence coupled with cognate-analysis shows that οἶνος was earlier ϝοῖνος /wóînos/ (cf. Cretan Doric ibêna, cf. Latin vīnum and English "wine"). Although these are clear examples of onomatopoeia, Socrates's statement that words are not musical imitations of the nature suggests that Plato didn't believe that language itself generates from sound words. Socrates: So mustn't a rule-setter also know how to embody in sounds and syllables the name naturally suited to each thing? And if he is to be an authentic giver of names, mustn't he, in making and giving each name, look to what a name itself is? And if different rule-setters do not make each name out of the same syllables, we mustn't forget that different blacksmiths, who are making the same tool for the same type of work, don't all make it out of the same iron. But as long as they give it the same form--even if that form is embodied in different iron--the tool will be correct, whether it is made in Greece or abroad. Isn't that so? Plato's theory of forms again appears at 439c, when Cratylus concedes the existence of "a beautiful itself, and a good itself, and the same for each one of the things that are". An early translation was made by *Thomas Taylor in 1804. The I.Bekker edition was published 1826 (London) under the heading Platonis Scripta Graece Omnia. A translation was made by H. N. Fowler and published during 1926 under Loeb Classical Library by Harvard University Press. ^ e.g. rhein ('flowing'), rhoe ('flow'), tromos ('trembling'), trechein ('running'), krouein ('striking'), thrauein ('crushing'), ereikein ('rending'), thruptein ('breaking'), kermatizein ('crumbling'), rhumbein ('whirling'). ^ e.g. ienai ('moving'), hiesthai ('hastening'). ^ e.g. psuchron ('chilling'), zeon ('seething'), seiesthai ('shaking'), seismos ('quaking'). ^ e.g. desmos ('shackling'), stasis ('rest'). ^ e.g. olisthanein ('glide'), leion ('smooth'), liparon ('sleek'), kollodes ('viscous'). ^ e.g. glischron ('gluey'), gluku ('sweet'), gloiodes ('clammy'). ^ e.g. endon ('within'), entos ('inside'). ^ e.g. mega ('large'), mekos ('length'). ^ pp. 6, 13-14, David Sedley, Plato's Cratylus, Cambridge U Press 2003. ^ Entry ῥεῦμα at LSJ. Besides the flow liquids, "ῥεῦμα" may refer to the flow of sound (Epicurus,Ep. 1p.13U), to the flow of fortune etc. ^ According to Dixon-Kennedy, https://archive.org/stream/MikeDixonKennedy.......encyclopediaOfGrecoRomanMythologybyHouseOfBooks/MikeDixonKennedy.......encyclopediaOfGreco-romanMythologybyHouseOfBooks#page/n159/mode/2up p. 143] (following Kerényi 1951, p. 230) says "...his name means 'the unseen', a direct contrast to his brother Zeus, who was originally seen to represent the brightness of day". Ivanov, p. 284, citing Beekes 1998, pp. 17–19, notes that derivation of Hades from a proposed *som wid- is semantically untenable; see also Beekes 2009, p. 34. ^ ἄναξ. Liddell, Henry George; Scott, Robert; A Greek–English Lexicon at the Perseus Project. ^ Chadwick, John (1958). The Decipherment of Linear B. Second edition (1990). Cambridge UP. ISBN 0-521-39830-4. ^ a b Cratylus 427a. ^ a b c d Cratylus 427b. ^ a b c Cratylus 427c. ^ Ademollo, Francesco (3 February 2011). The Cratylus of Plato: A Commentary (xvii). Cambridge University Press. ISBN 1139494694. Retrieved 2015-05-10. ^ Sedley, D. Plato's Cratylus. The Stanford Encyclopedia of Philosophy (Fall 2013 Edition), Edward N. Zalta (ed.). Retrieved 2015-05-10. This page was last edited on 2 December 2018, at 14:17 (UTC).